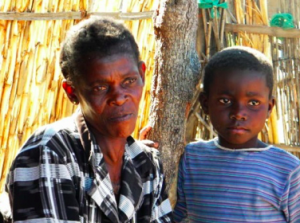 Lucky Kamanga is a mother of three children and struggling to survive Southern Africa’s worst food crisis in a decade. One of her children was able to attend boarding school thanks to the support of a Temwa bursary. Lucky’s two other children still live with her at home. But she is trying to save enough money to also put them through school. Hopefully, by working in her garden and with the support of Temwa, all of her children will be educated. This is something Lucky is passionate about, as no such opportunities were available to her when she was younger. However, this past year has been very difficult for the Kamanga family. Malawi is now facing its worst drought in 35 years. The Malawian government has declared a state of emergency and predicted that 40% of the population require food aid. As for Lucky and her family, they are living off of nsima – a dish made from corn flour and water which has no nutritional value. This food is usually the only daily meal they will have. But the price of nsima keeps increasing. It is already 80% higher than last year and the next harvest is not until March. “there is no money for fruit or meat and we can only eat what we are able to grow”. Thus, she has no nutrients to keep herself or her family healthy. Having run an emergency food distribution programme in early 2016. Temwa is now running mitigation and adaption projects to support families affected by the food crisis. If you would like to support Temwa’s work in this crisis, and help people like Lucky and her family, consider either donating or fundraising for us.